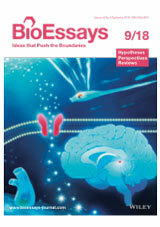 Hirai S, Okado H, (Neural Development Project) published a paper on “Developmental roles and evolutionary significance of AMPA-type glutamate receptors” in BioEssays. Organogenesis and metamorphosis require the intricate orchestration of multiple types of cellular interactions and signaling pathways. Glutamate (Glu) is an excitatory extracellular signaling molecule in the nervous system, while Ca2+ is a major intracellular signaling molecule. The first Glu receptors to be cloned were Ca2+-permeable receptors in mammalian brains. Although recent studies have focused on Glu signaling in synaptic mechanisms of the mammalian central nervous system, it is unclear how this signaling functions in development. Our recent article demonstrated that Ca2+-permeable AMPA-type Glu receptors (GluAs) are essential for formation of a photosensitive organ (regarded as a homologous organ of vertebrate pineal body), development of some neurons, and metamorphosis, including tail absorption and body axis rotation, in ascidian embryos. Based on findings in these embryos and mammalian brains, we formed several hypotheses regarding the evolution of GluAs, the non-synaptic function of Glu, the origin of GluA-positive neurons, and the neuronal network that controls metamorphosis in ascidians. Hirai S, Hotta K, Okado S: Developmental roles and evolutionary significance of AMPA-type glutamate receptors. In ascidians, GluAs initially mediate the influx of cations to induce photoreceptive organ maturation non-synaptically during the early developmental stage and then facilitate the transmission of signals synaptically to induce metamorphosis. 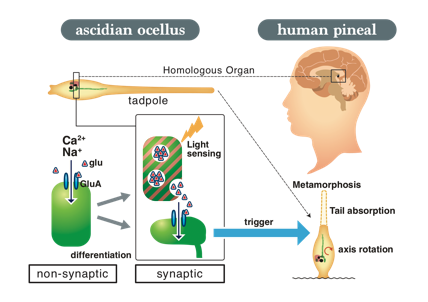 The ascidian photoreceptive organ can be a counterpart of the vertebrate pineal gland.